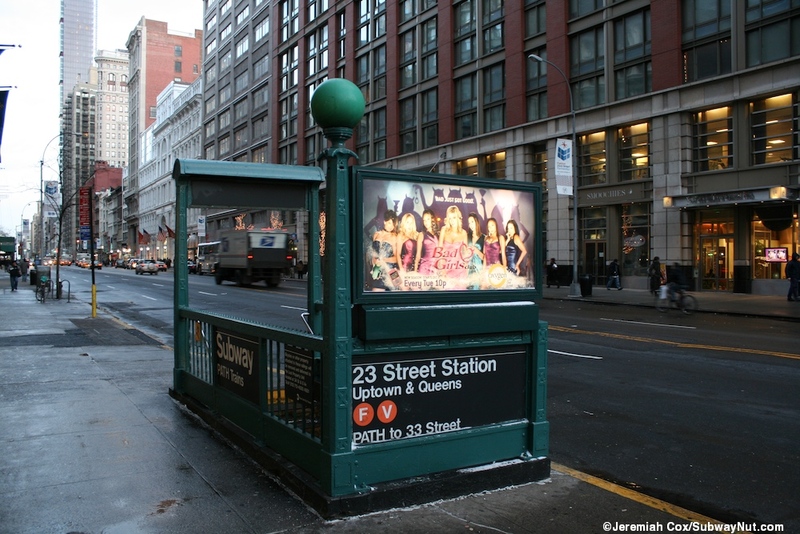 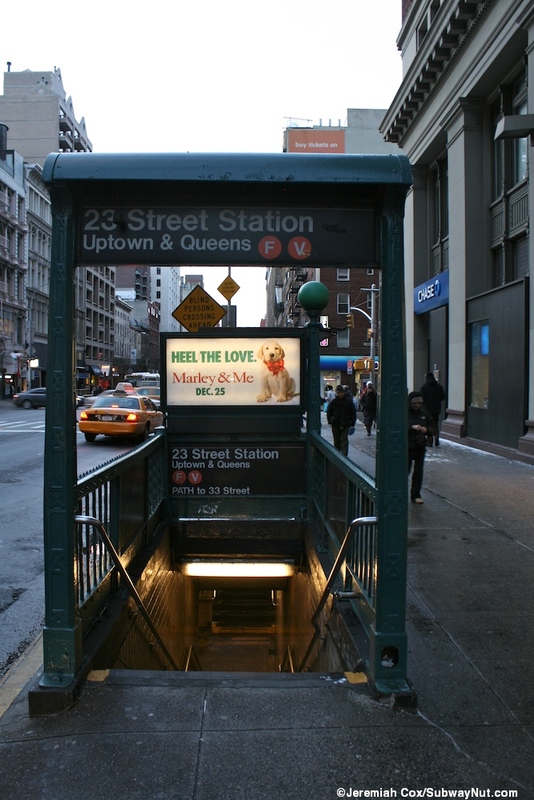 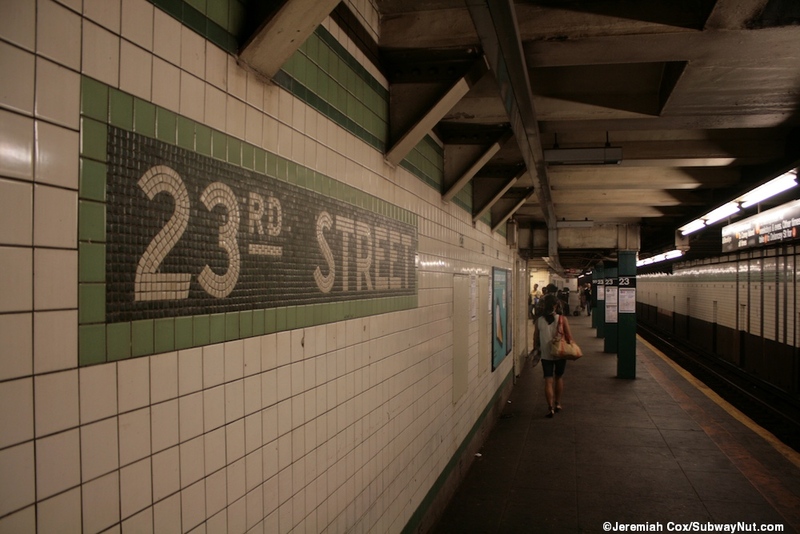 23 Street station has the subway tracks on various separate areas: the two upper level local tracks that stop at the station are on either side of the PATH trains and their 23 Street station that is in the middle of 6 Avenue. 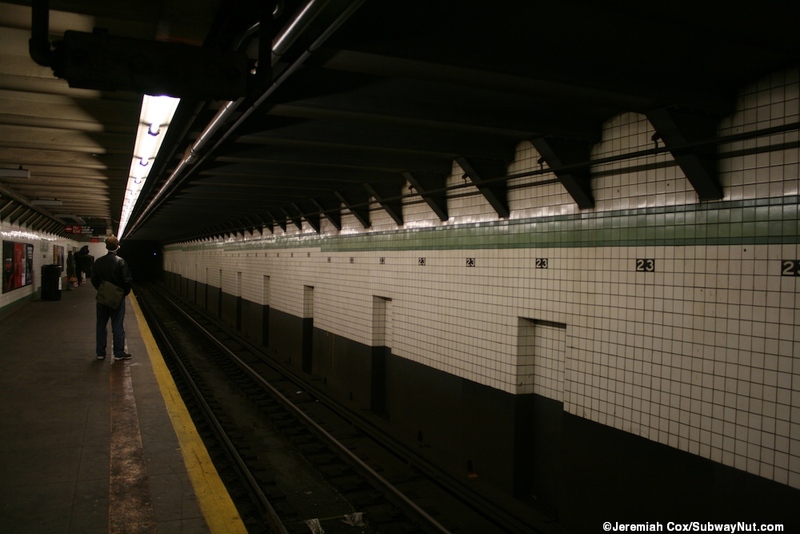 The two express tracks bypass the station and are in a bore tunnel beneath that actual has minimal previsions to be turned into a station stop if needed, this seems completely unnecessary. 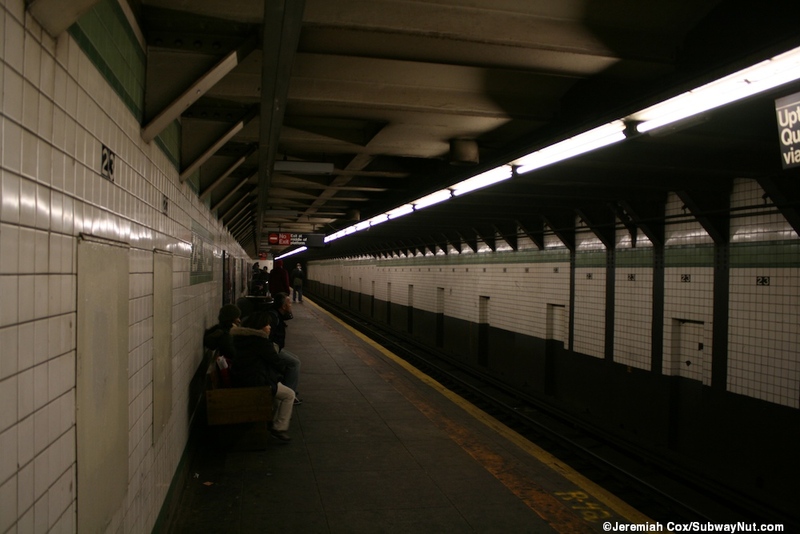 The two uptown platforms each are columless with a light green trimline and dark green border along both the track walls (the PATH platform is right there) and platform walls. 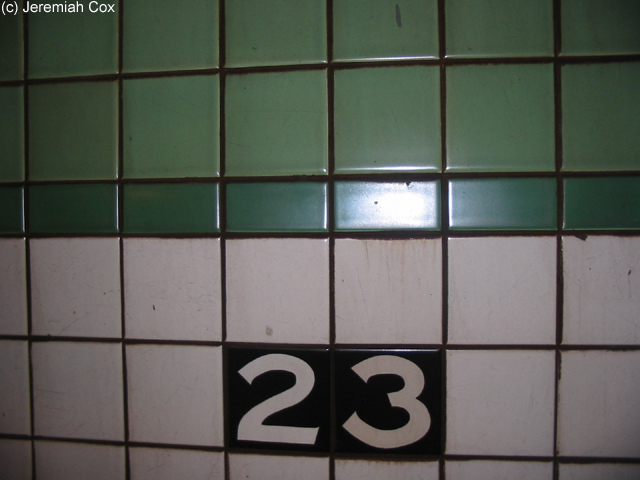 This in all locations has little 23s in black tiling beneath it. 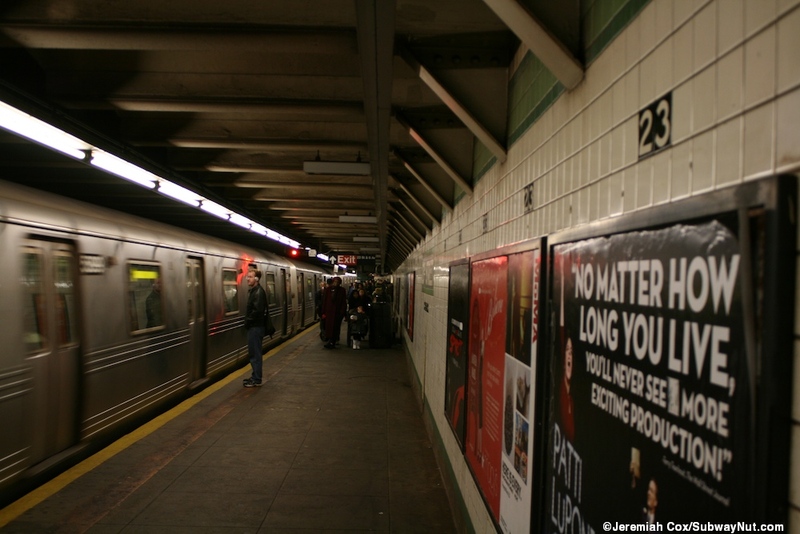 The platforms are columnless except for a few near the on platform fare control areas, one for each direction with turnstiles. 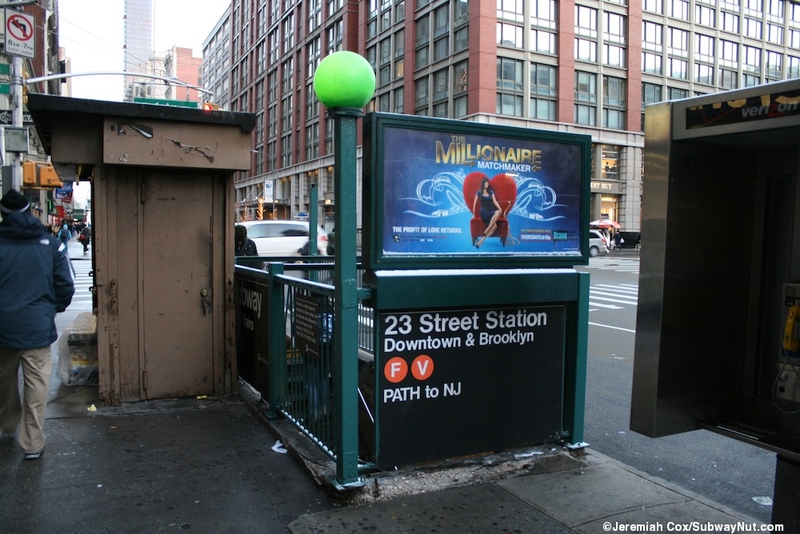 Each fare control area has a staircase down to the PATH train (no free transfers) in the same direction of travel (Uptown leads to the 33 Street-bound platform, downtown to the Jersey-bound platform) that go back upstairs to reach the actual PATH platforms. 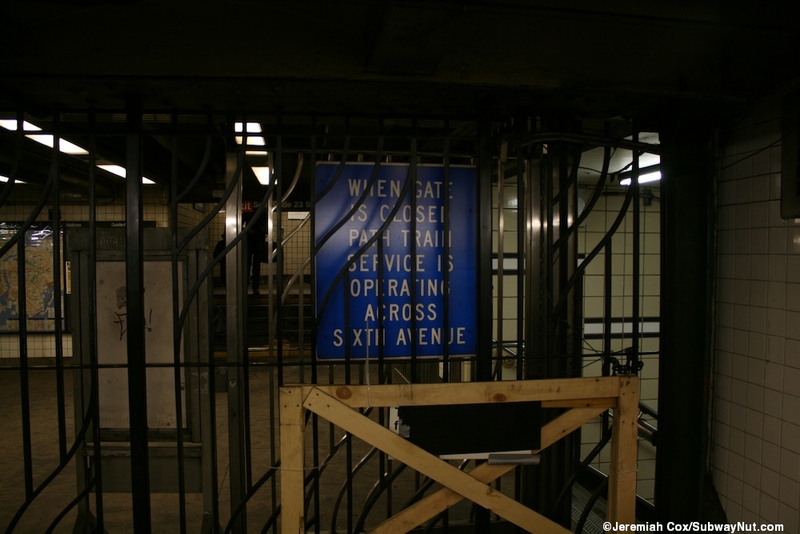 Exits from fare control area are 4 total two on each corner of 6 Avenue and 23 Street. 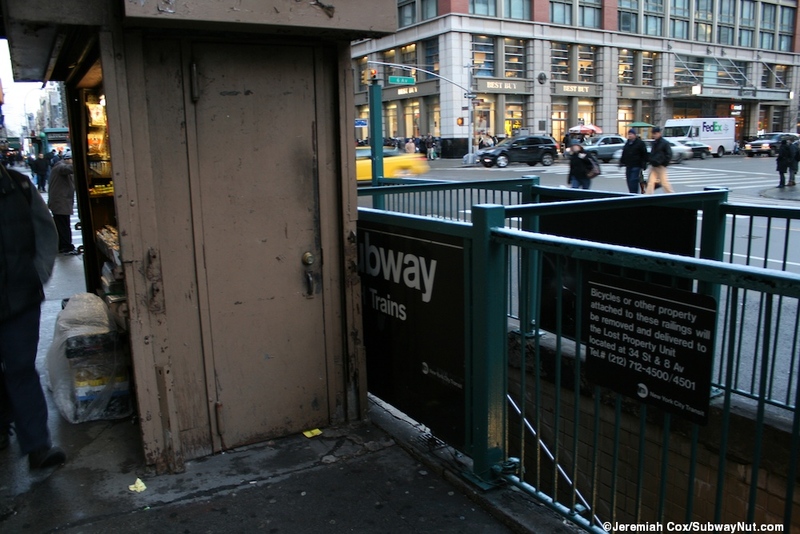 The northern street stairs look basically standard except one for each direction has a sign for Subway-PATH overhanging the entrance. 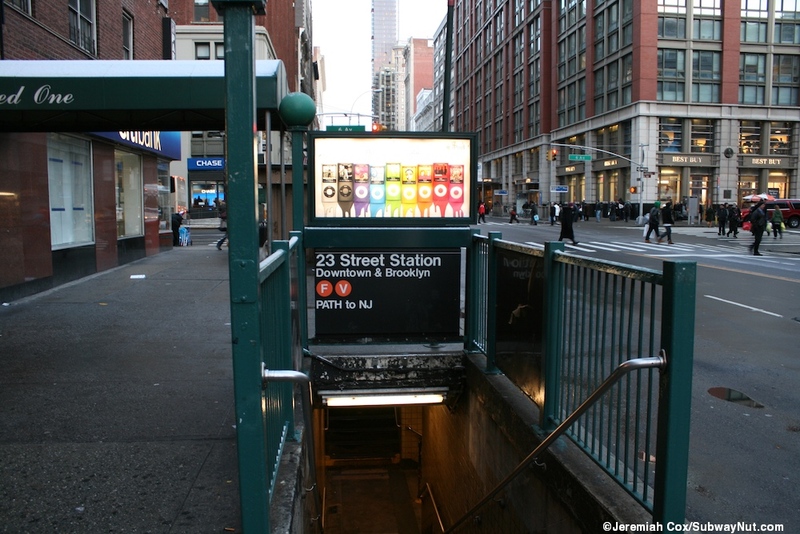 The side signs on the sides of the streetstairs also say Subway PATH. 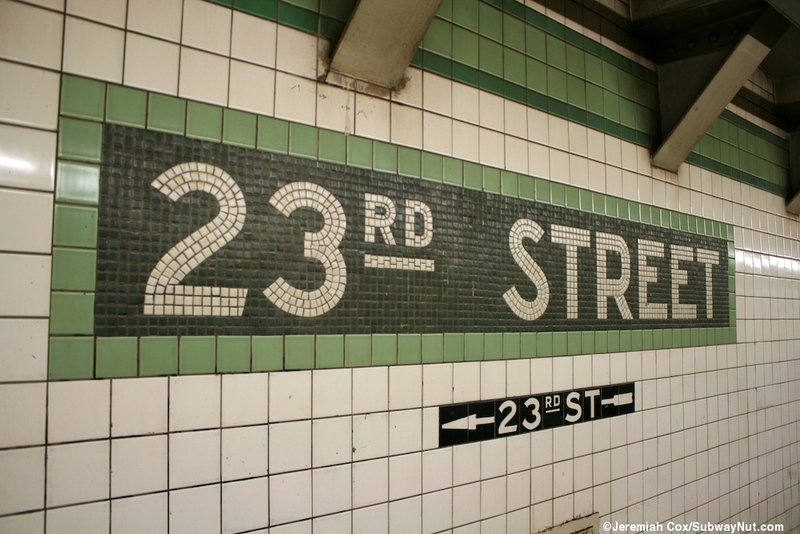 The ones on the south corners are more unique. 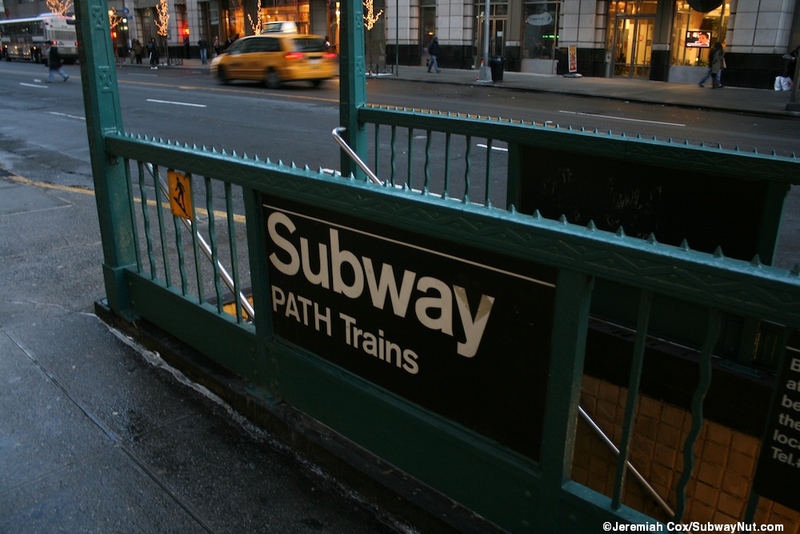 These are branded and maintained by PATH. 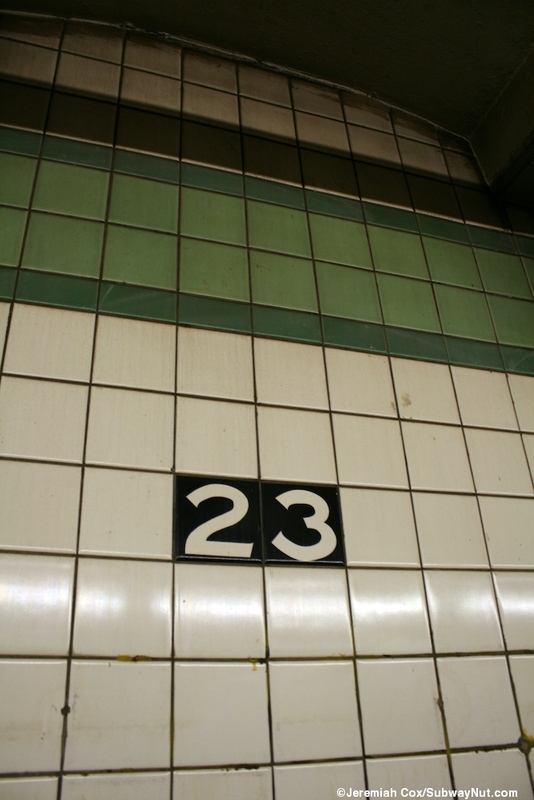 These have a polished silver color and signs above the entrances to the staircases for the direction of travel, the PATH logo, and an old M 2,3 (M being the MTA's old logo).